I was going to write this up as a Poe’s Point, but I realized I hadn’t really come to any sort of opinion on the issue–at least, not enough for an editorial. Marvel has put a moratorium on any further Marvel Zombie merchandise of any kind. Marvel was concerned about the negative image seeing their major characters would have on the public so they pulled the plug on any further Zombie products. So, those Marvel Zombies action figures that were sold in specialty stores and comic shops alongside figures based on A Nightmare on Elm Street, The Texas Chainsaw Massacre and Saw will no longer be produced. While the wording in the article is unclear, I believe the issue is that will all the press coming from the movies, Marvel has become concerned that the Zombies merchandise might horrify a naïve parent who wanders into Hot Topic to ask directions to Cinnabon. (Isn’t that exactly what it should do, though?) Or maybe they just don’t want their iconic characters (particularly Captain America) portrayed as cannibalistic undead. 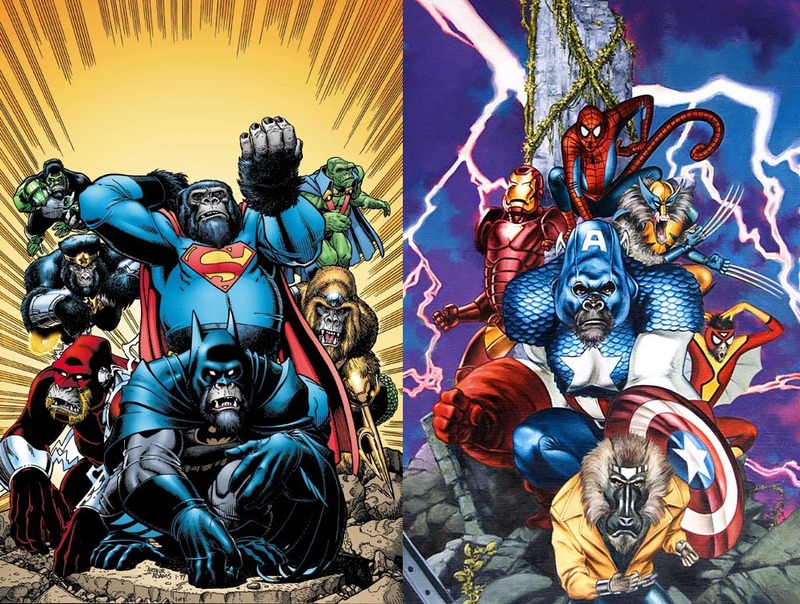 Still, Marvel Zombies as a comic series was immensely popular, and so Quesada & Co. have decided to follow it up with…Marvel Apes. Huh? Never mind the fact that this was done by DC in the “JLApe” storyline ten years ago, the concept doesn’t have any of the edge or satirical potential of MZ. That said, it’s all in the writing–Marvel Apes could be great, and set a precedent for a whole series of “Marvel…” miniseries (I’m hoping for “Marvel Sharks” myself). Hey, I’ve got an idea–how about Marvel Zombie Apes?! Now that I’d buy. TNI: You mentioned in the last Q&A that Lobo would not be made for the DCUC line because the character was too violent. Since the character has appeared in both the Superman Animated TV series and JLU series and seems no more or less violent than Darkseid, can you go into more detail on why this character won’t be used? Mattel: While many adult collectors enjoy our DC toy line, they are also toy lines aimed at kids. It was felt by the powers that be that Lobo was just too violent of a character to offer for toy stores. 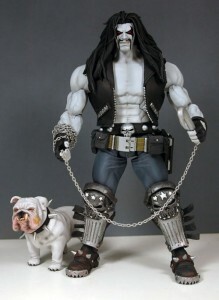 Although Lobo was relatively tame on the JLU animated series and Superman the Animated series, his comic books are a bit too violent for children – hence why doing a toy based on this character is off limits. When kids buy a toy they often look for the comics as well, and his comics are not kid friendly! In this case, while I disagree about how much of a threat to young kids’ psyche a Lobo action figure would be (I believe it’s incumbent on the parents to be aware of what their kids are buying and reading), I do understand where Mattel is coming from. The SDCC exclusive will be purchased almost entirely by adult collectors, so if The Powers That Be are that concerned about it, at least we’re getting him as an exclusive. While TRU usually balks at anything that mentions ‘hell’, or bears too much female flesh, the Hellboy figures will be on the shelves. This is possible because they’ll be packaged with the name ‘HB’ instead of ‘Hellboy’. Also, look for a soft drink tie-in, which will also eschew the use of the word ‘hell’ by calling Hellboy ‘Red’ and ‘HB’. I don't think Mattel's thing is that bad…the only one that really bugs me is the Marvel Zombies thing. Just seems dumb. Really? I've only seen one Zombie Hulk in my area, like, ever. Lots of Spideys though.